I mentioned last week that I had bought a highly recommended Sigma wide-angle lens. Here are the first photos taken with that new glass. 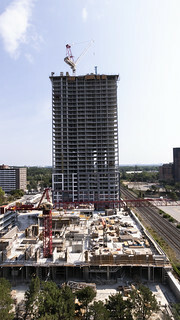 Next door, three new condominium towers are being built. This photo consisted of me mounting the lens on my EOS-80D, stepping out on to my balcony and taking this photo at 10mm. I am impressed that that focal length captures the construction in the foreground (which will become a smaller tower) and the crane on the top of the main tower. I tried to keep post-processing to a minimum here. I kept to the basics with some straightening and sharpening. My goal was to preserve what the lens “saw” as much as possible. 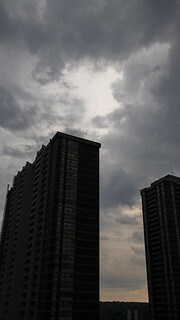 A few hours after that first shot was taken, a storm came rumbling over Etobicoke. There wasn’t a lot of rain – but it was a welcome relief from the day’s heat. I grabbed the camera again. This time, I was aiming across Mabelle Avenue. The sun was not quite ready to set, but some orange colour was on the horizon. As before, I primarily straighten and sharpened in Photoshop. I did tweak a little bit to emphasize the clouds. I am going to enjoy shooting with this focal range. I can’t wait to find more interesting subjects for it.